The heavy downpour was an unnecessary backdrop one weekend. For work commitments, I arrived late and in time for dinner. My friends were positioned on their respective beds lounging and watching television. It was a weekend forecasted for the lazy selves we have. The Hive Hotel and Convention Center will be our lair. 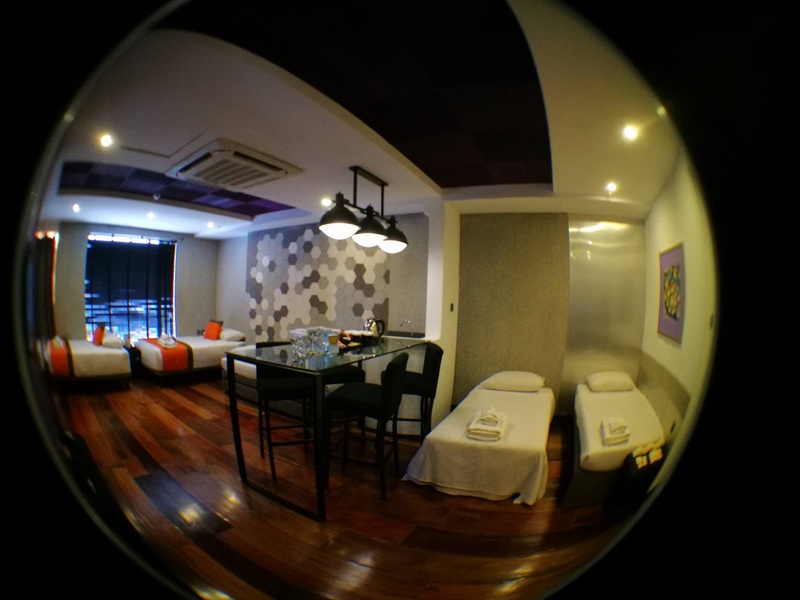 Though situated a block away from the entertainment strips of Quezon City – Timog and Tomas Morato Avenue and despite the fact that I frequent these streets when time is available, I have never heard of this eco-friendly hotel. The hotel is relatively new and indeed presents a unique interior concept with an advocacy for its existence. It presents itself as a green hotel. I was warmly greeted and welcomed by the courteous receptionists of the hotel as I enter the premises. The reception area is vibrant complete with colorful loungers and sofa, books neatly arranged complementing the interiors and a business center on one corner. The orange and gray colors is said to represent the vibrant but calming atmosphere that the hotel wants to maintain - a combination of colorful retro and era and the simplicity of modern elegance. The said colors are prominent even on the common areas of each floor and the rooms itself. The group was assigned to two rooms. First is the party room situated at the 6th floor at the Sky Garden. 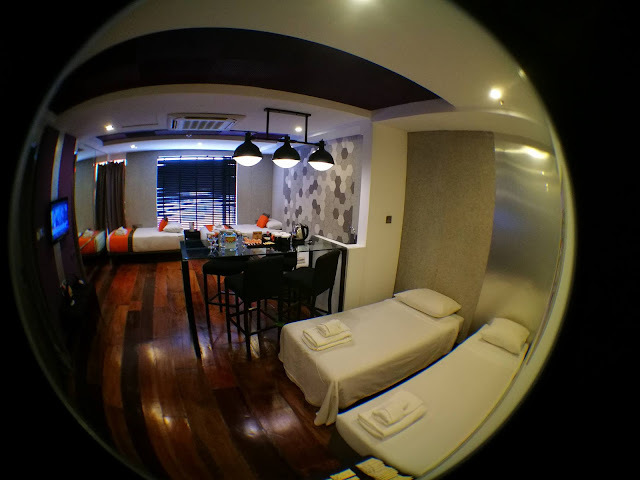 And the second one is a deluxe room with a modern retro feel and a city view. The party room is indeed spacious and good for family and friends. As an eco-friendly hotel, all trash bins are segregated for biodegradable and non-biodegradable. I had a deep and quality slumber while at the hotel. The top of the line beds has pocket springs and memory foam with a 400-thread count, 100% Egyptian cotton bedlinen, 90% goose down duvets and circle-of-down pillows. For the deluxe room, there is a full single size bed as sofa bed and standard bed pull-out that lifts up to the same bed level. The bath experience is likewise refreshing. The ensuite bathroom has a rain shower with hot and cold water, 100% Egyptian cotton towel sets, 100% cotton Yutaka bathrobes, 100% organic, eco-certified bathroom amenities. The room has 2 single beds and 1 double sofa bed. All rooms are non-smoking in keeping with its being a green hotel. Basic room amenities include: 32” LED Cable TV with USB port for DVD, MP3, Inverter air-conditioning, coffee/tea service, mini bar, hair dryer, in-room electronic safe, IDD/NDD retro-style rotary telephone and of course, wireless internet access in the room. There are three amenities at the Sky Garden just outside our party room. These are: The Sky Garden Restaurant, Jacuzzis at the Sky Garden and the Exercise Nook. Complimentary breakfast is served at the Sky Garden Restaurant. They have good offerings for breakfast ranging from Filipino, other Asian and Continental cuisine. Pastries and bread are likewise available. The hotel has no swimming pool yet it provides Jacuzzis right in front of the party room and adjacent to the Restaurant. It provides a resort ambiance featuring rustic reclaimed wooden shower doors, granite floors, wooden deck and a garden. Cardio equipment is likewise available at the sky garden for health conscious guests. Receptionists have all-out smiles when greeting guests. That itself makes the stay welcoming. Efficient service is likewise provided and in the true sense of urban hospitality, the Hive Hotel exceeded my expectations.